2. While pasta is cooking, combine in a small bowl, the hoisin sauce, soy sauce and sesame oil; set aside. 3. In a large nonstick frying pan or wok, stir fry pork in 2 teaspoons canola oil for 3 minutes or until no longer pink. 4. Remove and keep warm. In the same frying pan, stir fry the red pepper, peas and onion in remaining oil for 3 minutes. 5. 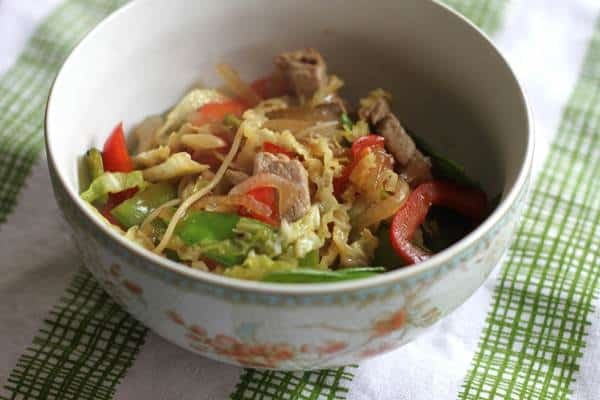 Add cabbage; stir fry 2 minutes longer or until vegetables are crisp tender. 6. Stir reserved hoisin sauce mixture and stir into frying pan. 7. Return pork to the pan; heat through. 8. Drain pasta and add to frying pan; toss to coat. 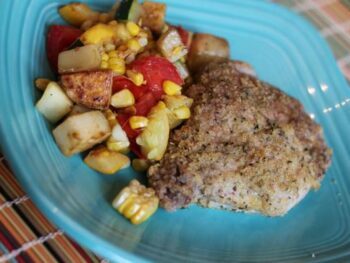 Sprinkle each serving with 1 Tablespoon cilantro.